Tracy and Dave continue the conversation about managing pasture land and show what a few weeks growth in a healthy pasture looks like. Pasture management is a system by which farmers and ranchers manage their acreage in order to gain the best possible yield for their animals with as little stress on the land as possible. Regular “pasture walks” accomplish a great deal and allow the farmer to recognize the rate of consumption of the grasses and plants as well as address any problems that arise. A conscientious farmer will also pay attention to the amount of manure collecting on the pasture. Rotational grazing will allow sufficient re-growth and minimize damage from animal “tramping” as well. Pasture management is a year-round responsibility. Remember to soil-test your pasture. 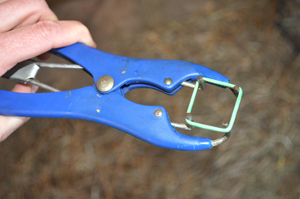 See if there’s anything to “feed” it so that it may, in turn, provide feed for your livestock. The local cooperative extension in your area is, as always, a great resource! Tracy and Dave discuss a comprehensive approach to managing pasture land and promoting optimal health among the flocks. Witnessing the release of the animals to pasture near the end of the program will delight the child in all of us. 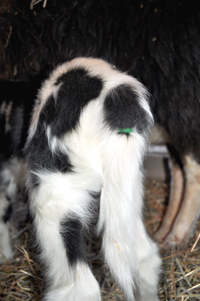 There are two schools of thought on tail docking or removing the tail of a lamb. School # 1 says it’s not humane. I am not of this school. So, let’s move on to School # 2. It has taken me four years of lambing and, thus, banding to reach my conclusion that banding must be done on day two. Day Two, the lamb has filled out physically and by Day Three of life, I believe the tail has become thicker and, possibly, more sensitive. Once, I unknowlingly waited for days before banding a pair and watched in horror as they both flopped around in pain. I cried, standing there helplessly, thinking I’d surely killed them both. They recovered; I never forgot. Therefore, I band on the second day of life and haven’t experienced another incident like that. 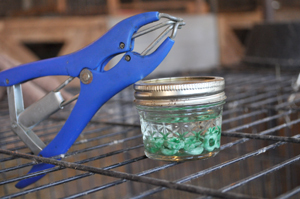 The banding tool stretches a thick green rubber band that allows one to travel up the tail, position, then release the band. I prefer to leave at least 1-1/2 inches of the tail and not go any higher than the two gentle folds of skin which are on the underside of the tail. Believe me, the lamb realizes what has just occurred. However, the reaction I generally witness, if done at the “right” time, is a flurry of their tails as if trying to shake the band off (it usually falls off in one to three weeks). Almost 99 percent of the time, they go straight to mom’s udder and have a drink. Probably not a bad idea. It’s been ten days since our littlest guy began his bottle feedings. In the beginning, I had to lift him to a standing position so that he’d feed (as if he was nursing from mom) and when finished, he’d find his spot, curl up, and lie down again. I’ll admit: I had my doubts he’d make it. Tate has since graduated from drinking a half cup of replacer at each feeding to almost a full cup. He’s still relatively small in stature compared to the other lambs his age and his actions are a bit tentative. However, his feedings in the morning are quite aggressive—a good sign that his strength is building (slowly, but increasing). We have been careful to watch momma Brownie as well. It’s still a mystery as to why she rejected him in the first place. Our good friend and fellow Churro breeder, Linda Cummings, suggested we keep Brownie under close supervision because apparently these situations have been known to become violent. In this case, I suppose it’s a good thing Brownie wants nothing to do with Tate. Oh, don’t worry though–he’s getting plenty of love and attention from us and from his sister. Churro siblings seem to instantly bond. She is as playful and as loving as she can be. In a week to ten days, everyone will be out on pasture and in one, big, happy flock so he’ll have lots of support from the other 16 newbies! 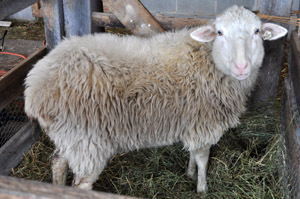 Brownie (named for her caramel color) is one of our most affectionate, sweet, and lovable ewes. She had a single lamb last year—a little brown girl, Friday. She twinned this year: the first, a little brown girl and the second a little white boy. One of the first signs you look for in newborns, once they’re on their feet (which is normally minutes after being cleaned by their moms) is whether they’ve latched on to mom’s udder. The first pulls provide the colostrum from momma which is essential to getting baby off to a healthy start. 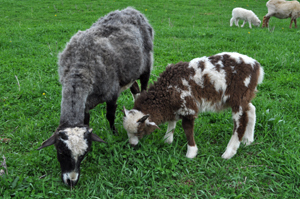 Imagine our surprise when Brownie would not let either baby latch on, especially the little white ram-lamb. It’s absolutely heartbreaking to watch a wobbly little newborn attempt to bond and the mom keeps inching away or turning from the baby. Some say rejection can be rooted in the baby’s color. I don’t know if it was the case here but I’m suspecting it might play a part in her rejecting the little white ram-lamb. Brownie nuzzles him and will answer him…sometimes (other moms will call out immediately to newborns) but her attitude just seems different with the little brown girl. Yesterday, we brought him in the house. He appeared so weak and thin and cold all of a sudden; it’s amazing how quickly they can slide downhill. We placed him in a towel, under a heating blanket on “high” and held him for hours while giving him Purina’s “Kid Milk Replacer” with a syringe. 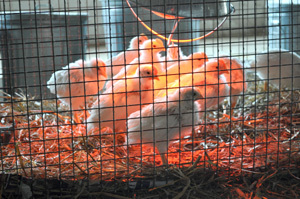 It is a powder formula you mix with hot water– specifically for livestock babies. After five hours inside, offering replacer and warm water, he appeared a little more energetic so we took him back out to momma’s stall. She seemed genuinely happy to see him. Nevertheless, we’ll keep a watchful eye on him, keep the replacer coming at prescribed intervals (he drank a full “dose” this morning!) and, of course, bring him to cuddle on the couch….often. Our first lambing season was incredibly exciting because we had absolutely no clue what to look for in a ewe that was close to delivering. 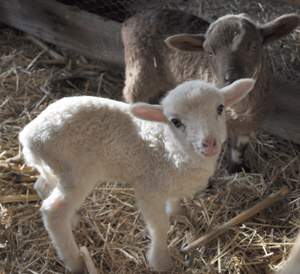 The entire family constantly ran to the barn for “ewe-checks” to see if a lamb had just dropped out. 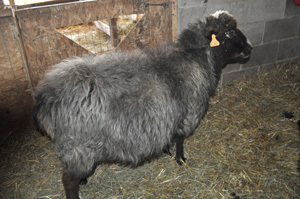 Linda Cummings (Shepherd’s Loft Farm) had given us a few pointers—physical traits to be on the look-out for—still, at four months, I was convinced Reese was ready to deliver at any minute (sheep gestation is five months). Here are some photos taken this morning with some ewes drawing closer to their due dates. As I’ve said before, the Churro tend toward multiple births and it’s rather easy to tell who will “twin” at this point. 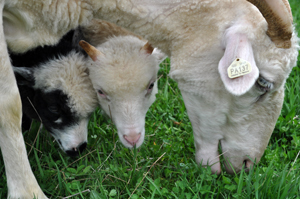 This late in the game, the babies are putting on most of their weight which really makes the ewe’s belly protrude. On Reese, you can see how she’s “rounding-up” on the sides. Late in the gestation period, the lambs appear to move forward from mom’s back hips and make a mound on each side of the ewe. In this next picture Pixie, a first-time mom this year, is carrying twins (99 percent sure). Notice the area along her spine seems to have “hollowed out”? That’s another trait to look for signifying the late stages of pregnancy. My camera was flash-happy and evened out the shadows or the “hollows” would have been easier to see. 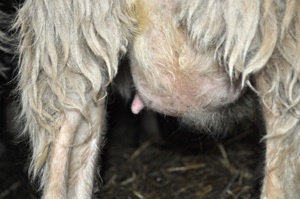 One sure-fire way to tell that lambing is just days away is the ewe’s udder. 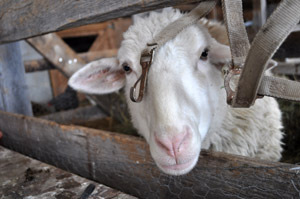 In preparation for the lamb’s arrival, the ewe will “bag-up.” Her udder will begin to fill with milk and the physical change in the udder is undeniable. This will be our fifth lambing season and, although we now have a few years experience, it is still an incredibly exciting event. I laughed out loud when I took this picture. I was so careful to line up behind Reese. 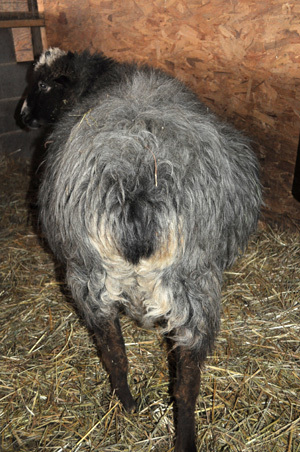 I wanted that perfectly square-on shot from her back end to show her growing abdomen (her lambing is just weeks away). Normally, she doesn’t let anyone stand behind her for too long. She is the matriarch, after all, and is usually front and center with everything and everyone. The reason I wanted the picture in the first place, was to show her symmetrical, expanding abdomen. With only two weeks left until the start of lambing, the ewes that appear to be carrying twins are shaping up nicely — almost as if they have saddle bags hung neatly on each of their sides. Early in the gestation, I jump to all sorts of conclusions based on the way they are “presenting.” One year, I was convinced Reese was only carrying one lamb (she has always twinned). She was carrying so low, and her sides just didn’t seem to protrude like they did in years past. 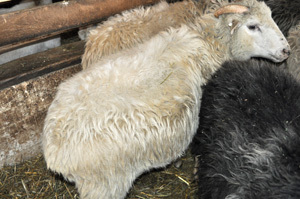 When she went into labor, we watched in amazement and delight as she gave birth to triplets! This year’s shaping up to be just as exciting….stay tuned! Colette was to be one of our “new moms” (everyone is due in a couple of weeks). 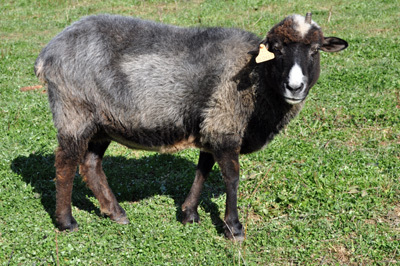 She was bred for the first time last October when we brought “Blue,” the ram, to our farm. With Colette, we knew we’d have a special delivery, or deliveries (Churro tend to have multiples). She’s a big girl and has great Churro conformation. Not only that, but her temperament is so very sweet. So, like I said, we knew she was going to “throw” special babies. I was certain. 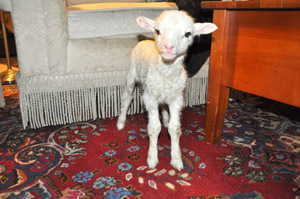 About 10 days ago, David came in from the barn and said one of the ewes had given birth during the night. I knew instantly the lamb couldn’t have lived. None of the ewes were at full-term (5 months). After checking all the ewes in Colette’s stall, we found evidence it was Colette who had miscarried. I was headed to New York that day for a shoot and left, heartbroken. She seemed to be acting fine. She was eating. There was no additional discharge. We all just figured Nature had run its course and, for whatever reason, the odds were against that little ram-lamb. I was shocked to learn (once again, on another shoot a week later in NY) that Colette was in labor again. It hadn’t even dawned on any of us she could still be carrying another lamb! 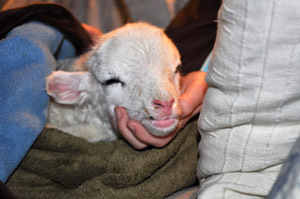 Unfortunately, she needed assistance to deliver; this lamb was, also, stillborn. David ended up calling the vet at midnight and I was so glad he did. Dr. Dickerson helped deliver a sour afterbirth and administered antibiotics to clear any infection. After 5 years of lambing, this is our first experience with a miscarriage. It’s a very sad occurrence but, thankfully, Colette seems better now and hopefully, she’ll have a better go of it next year. She’ll be a wonderful mom with beautiful babies; it’ll be worth the wait. This is Reese, the matriarch of our flock. I took this picture because she was looking “fluffy.” Mind you, it’s not a word I use often when describing my sheep, but it seemed as though her coat had changed, almost overnight. She was sheared six weeks before so she already has over an inch of coat growth. 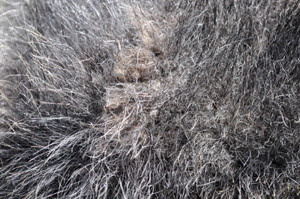 The Navajo-Churro fleece consists of both wool and hair. 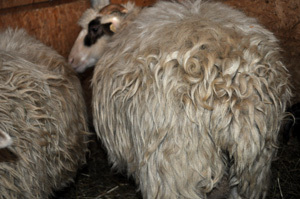 The inner coat of wool is the closest growth to the skin and is a separate layer from the “hair”, which are the longer locks you see draping the sheep later in the season. 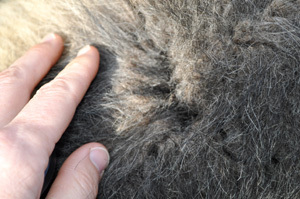 The inner coat can grow to three to six inches and represents roughly 80 percent of the fleece. The hair, or outer coat, comprises 10 to 20 percent of the fleece and can have a staple length of six to 12 inches. Reese is my girl (remember in the blog post about the pasture gate—she “called out” that it was open)!! She’ll always walk to me to get a back scratch or shoulder rub but doesn’t like the camera. So for me to be able to snap a quick photo of her fleece was a pretty special occurrence. It’s easiest to see the wool-hair variation on her because of her coloring and markings. She’s definitely pregnant, too—I can tell—so I’ll make time for lots of back-scratches and shoulder rubs in these coming months.